Author Isobel Hunter-Brown, who worked alongside R.D. Laing in Glasgow, seeks to set the record straight. From the contemporary perspective, Laing is admired both as a pioneer of ideas and as a charismatic and prominent anti-psychiatrist. Hunter-Brown reveals, however, that Laing's view of sanity and insanity as a continuum and his opposition to high-dosage, anti-psychotic medication already formed part of the Scottish psychiatric tradition. Hunter-Brown argues that the culture of the Glasgow units in which Laing worked early in his career had already been strongly influenced by the Scottish psychoanalyst Fairbairn. Furthermore, for decades prior to this, their inspiration had traditionally been drawn from Adolph Meyer, who promoted a holistic view of his patients, exploring biological, psychological, and social dimensions as part of their diagnosis, an approach that is widely believed to have originated with Laing. 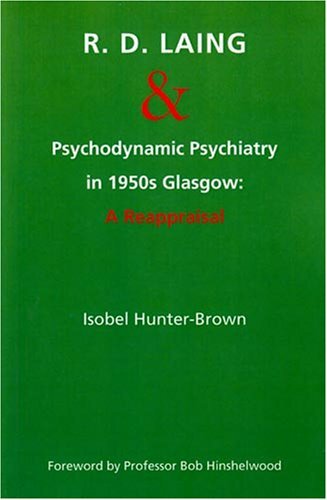 Psychiatrists seldom write about their profession, but this author describes the inner workings of psychiatric practice in Glasgow during the 1950s and the way in which some practitioners in that allegedly barbarous era were already using psychodynamic methods to help their patients.